The biodiversity of Ecuador make it like you are riding all around the world, but all in the same country. Experience sunsets on the Pacific Ocean, glaciers topping conical volcanoes high in the Andes and the vibrant wildlife of the Amazon, all in one adventure! We hand picked some world-class paved roads and unique and comfortable accommodations, so be ready to enjoy this humble, welcoming South American country. Road Conditions: This is a mostly paved itinerary with some gravel sections. DAY 1 - Arrival in Quito. We'll pick you up from the airport and settle you into your hotel before our celebration dinner at one of the city's best restaurants. Ride north to the small mercantile town of Otavalo. Otavalo is famous for woven clothes and blankets. We will arrive early at our hotel today, so we will have a chance to explore the surrounding area including Cuicocha Crater Lake and other side roads. Stay in Otavalo. Ride through the Andes today. We will check out Cuicocha Lake at the foot of the volcano of the same name. We will check out the Middle of the World monument, the very location of the world's equator. We will drop down to the small town of Mindo, to one of the most unique ecosystems on Earth. The elevation of the steep slopes of the Andes allow "niche ecologies" to exist. We will be staying in a reserve where some of the most rare hummingbirds in the world live. Enjoy the cloud forest known for its butterflies. Stay in Mindo. A reasonably big day is in store for us today starting with dropping down nearly 5,000 feet to the coast of the Pacific Ocean. You will see the landscape change from cloud forest to banana plantations to white, sandy beaches. We finish the day riding along the Pacific Ocean and stay at a beach resort. Time to relax with a sundowner in hand and waves crashing against the shore. Stay near Canoa. This is a day completely dedicated to coastal riding, seafood, beaches and the Pacific Ocean. We will get in early at our destination at Puerto Cayo, so there is plenty of time to scout further down the coast in search of the perfect beach at National Park Los Frailles. Stay in Puerto Cayo. This is our longest day and most biodiverse. We will be leaving the warm, coastal ecosystem for the cooler altiplano, high in the Andes. The road today is one of the best you will ever ride, climbing thousands of feet into and through the Andes. Stay in Salcedo. Today, you will spend a good part of the day riding around epic Mt. Chimborazo. At 20,564 feet, its Ecuador's tallest mountain, and the tallest mountain along the equator in the world. Get ready, your day is just started, as you will now take an outrageous road, descending thousands of feet to the Amazon Basin at Macas. We will be staying at a boutique wilderness lodge this evening right on one of the Amazon’s many tributaries. Stay in Macas. Lounge around the pool and hot tub and consider a massage at the hotel, or venture to a waterfall in the jungle and go for a swim! The day will be dominated by the Amazon Basin. Take in lush vegetation and vistas of large rivers, churning towards the Atlantic Ocean. Enjoy the world-class road between Puyo and Baños, as you climb thousands of feet up to the Thermal Hot Springs resort town of Baños. We will get into town with plenty of time to explore the town or you can take advantage of the spa facilities at our resort. Or do an adventurous loop outside of Baños which features stunning vistas of the volcano Tungaragua. Stay in Baños. 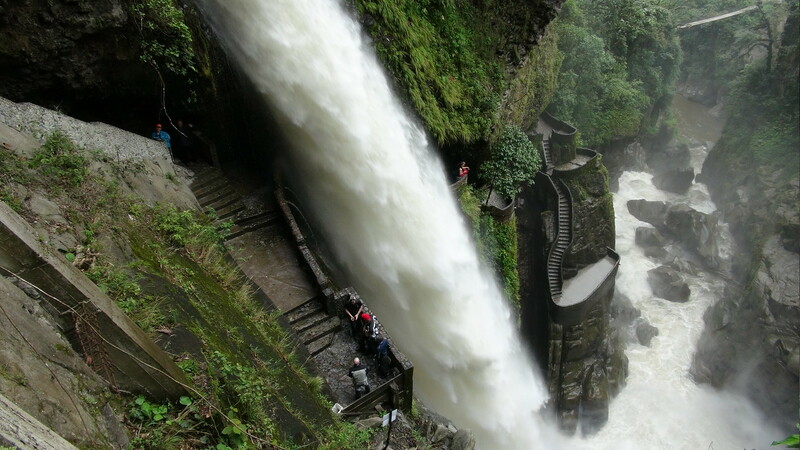 This will be a fun day as we retrace our steps to Puyo, and on the way down, we can check out one of the spectacular suspension bridges that span the steep canyon, which leads to a breathtaking waterfall. We will arrive at Puerto Misahualli early in the day, on the Rio Napo, a major tributary of the Amazon River system. Stay near Puerto Misahualli. We are headed to a thermal hot springs destination nestled high in the Andes. Along the way features a winding road, which eventually climbs high into the Andes. Stay in Papallacta. Before we reach Quito we will make a exclusive sojourn into the Antisana Ecological Reserve. Farewell Dinner tonight. Stay in Quito. DAY 13- Depart from Quito, or keep the dream alive.